Prof. Mark Scott (BSc DipTP PhD MIPI FRGS) (Project Leader) (UCD): is a Professor in the UCD School of Architecture, Planning & Environmental Policy (APEP). Mark has authored over 100 publications, and has received over €5m in peer-reviewed research funding from the EPA, RIA, IRC, the Heritage Council and the DECLG. He has acted as an advisor on spatial planning to the Oireachtas (Parliament) Environment Committee, the N.I. Assembly Environment Committee, the N.I. Housing Executive and Dublin City Council. His research interests include environmental planning, green infrastructure, resilience and urban design on which he has published widely. He has extensive experience of managing inter-disciplinary and applied research projects including the EPA funded Eco-Plan project on green infrastructure and spatial planning. 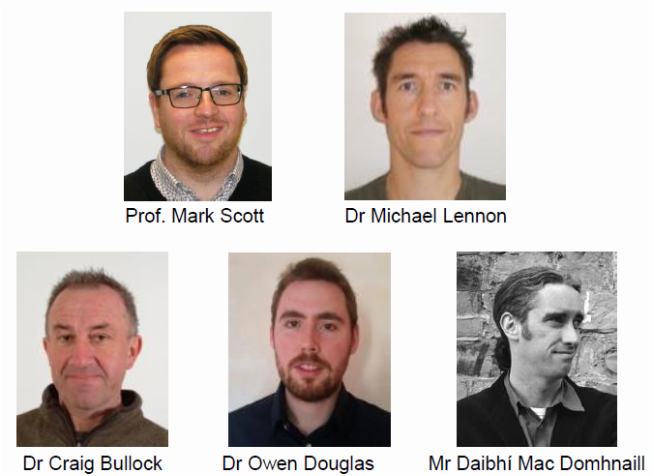 Dr Mick Lennon (BA MA MSc PhD MIPI MRTPI): is a Lecturer in Planning & Environmental Policy in UCD APEP, having previously been a lecturer in Cardiff University’s Planning School. He has worked as a planning practitioner nationally and internationally (private and public sectors), holding senor practitioner positions formulating spatial policy and project managing environmental assessments. Mick has particular expertise concerning the ecosystems services approach to spatial planning in Ireland and has undertaking the most comprehensive study of this to date and has published widely on the intersection between spatial planning policy and ecosystems services, with a particular focus on mobilising the GI concept. Dr Owen Douglas (BA(Mod.) MRUP PhD): is the full-time Post-Doctoral Researcher appointed to the Eco-Health project having completed post-doctoral research on environmental noise and human health in UCD APEP. He holds a BA (Mod.) in Economic and Social Studies from the University of Dublin, Trinity College (2007) and is a qualified Planner having graduated with First Class Honours from the UCD Master of Regional and Urban Planning Programme in 2009. Owen's PhD research investigated issues of sustainable development, population well-being and quality of life in the contemporary urban environment. Dr Craig Bullock (BA MA PhD): is a Research Fellow in UCD APEP with expertise in environmental valuation and cost benefit analysis. In the area of greenspace, he was the European Coordinator for the EU FP4 project Greenspace 2001-04 which examined the value of urban green areas and lead author for the EPA Strive study linking Quality of Life and the Environment (2008). More recently, he prepared the study of economic benefits of GI for the EU Interreg Park Atlantic project and has also co-authored various reports for DAFM and Coford and papers on forest amenity, including health benefits. In the area of ESS, he was the lead author on the Department of Environment report on the Benefits and Costs of Biodiversity in Ireland. He is currently an Irish partner in the EU FP7 project OPERAs (www.operas-project.eu) which examines sociocultural values associated with EES, including health and well-being. He is currently Ireland’s representative to the Intergovernmental Panel on Biodiversity and Ecosystem Services (IPBES) regarding diverse conceptualisation of values. Daibhí Mac Domhnaill MILI: is an Occasional Lecturer in UCD and is a landscape architect and urban designer who for over 15 years has worked on a wide spectrum of projects; from master planning new urban neighbourhoods, transport interchanges and industrial lands to overseeing the implementation of hard and soft landscape works on a variety of projects. From 2002-2007 Daibhí worked as an urban designer for Murray Ó Laoire Architects. Projects undertaken here included the award winning Killarney Urban Masterplan and Ceannt Station Masterplan, Galway. Daibhí has extensive practice experience and is currently Principal for AIT landscape + urbanism Consultancy, recently completing GI strategies on behalf of Dublin & Fingal local authorities. In 2010, he chaired a Working Group on GI on behalf of the Urban Forum.